Is leadership nature or nurture? Are leaders born with the ability to persuade and influence others, or is leadership a learned skill? Although studies have detected a leadership “gene,” further research has shown that significant influences from environment and experience were needed to develop leadership skills. Leadership is a skill that can be developed, regardless of genetics or personal experience and environment… Leadership can be learned! This one-day course will give case managers and case manager supervisors the background to understand what is truly meant by leadership; how to incorporate leadership skills and styles into your own style; how to hire the talent you need not only to carry out your work but to develop new leaders; how to be a resilient leader for your team and instill resilience in them too; and how to carry out improvement on an ongoing basis in your style and in your team’s work environment. Care managers, case managers, and supervisors will begin this program with an in depth look at leadership myths, the reality and definition of reality, and the reason for investing in leadership development. You will also review the traits and characteristics of effective leaders, and learn key leadership styles. Next you will explore influence, persuasion, and power, and gain ideas on when influence, persuasion, and power can be effective or may be ineffective. Lastly, this portion will cover four leadership competencies, tips for building leadership competency, and strategies for creating individual leadership development plans. Case managers/care managers wear many hats: they are educators, coordinators, collaborators, definitely communicators, negotiators, advocates and more! 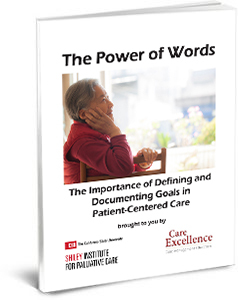 In this information-packed portion of the day you will identify essential skills needed in your care managers, and review effective screening and hiring practices for new care managers. You and your classmates with gain understanding of the value of critical thinking skills in your team, and will explore the importance of values, reactions and adaptability in your care managers. Care managers, in today’s competitive job market, seek leaders that expand their opportunities and skillsets while making them feel valued. You as the leader sets the work environment, and your skills in this area can make your workplace enjoyable or unbearable. The Job satisfaction and turnover module begins with a comprehensive discussion of what care managers need from their leaders, how to incorporate consistent constructive feedback, what it is and why it’s important, and how you can look for and assure opportunities for your staff’s empowerment. Lastly, this module explores turnover issues, and strategies for reducing turnover. Care management it a stressful and demanding profession not only for the care managers, but also for the leaders who guide, train, and supervise care managers. Therefore, it is important for care managers and their leaders to understand and engage in opportunities for stress management; reducing burnout, and enhancing resiliency. This concluding module of the Leadership program begins with a review of the challenges of stress management, will provide a framework for understanding the driving forces of stress, and provide methods for managing stress. Burnout is explored in depth, not only factors contributing to it, but how to identify it in your staff, what the consequences of unmanaged burnout may be, and how to address it. This section will also provide leaders with tools for understanding, building, and enhancing both physical and emotional resiliency. 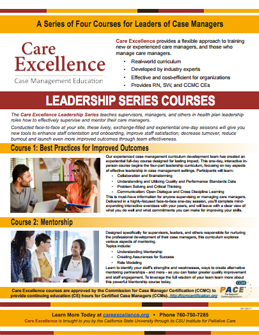 Leadership has been pre-approved by the Commission for Case Manager Certification (CCMC) to provide 8 hours continuing education credit to Certified Case Managers (CCMs). Leadership consists of one day of face-to-face training, covering its four modules of lecture and interactive learning. Below are some Fast Facts about this course and its modules. Please call us for more information. Provides: 8 nursing, social work and case management (CCM) continuing education hours upon successful completion of the one-day course. Antonakis, J., Cianciolo, A.T., Sternberg, R.J. (2004). The Nature of Leadership. Sage Publications.